....that it has been five years since 710 and I got married? Sure, you can tack on another 25 to that since we had been together, but today marks our fifth anniversary since getting hitched in DC. Of course, now everyone can get married anywhere in the U.S. - save maybe one county in Kentucky if all of the other clerks are on PTO. Yes, the jokes just seem to write themselves, don't they? So I'm taking the high road - which Magic Mike always wonders how I found that byway. It is certainly not on any map I own, nor could I ever follow there, as he's only 'read about it'. Ok, I'll take the imaginary high road and no 'wood' jokes. I'm a properly married man now! We are experiencing the same weather these last few days that we had back in 2010. Blue skies, temps in the 60s (in November!!! ), and sun. And somewhere, someone has all my reception and rehearsal dinner pictures.........the bastards. Five years later, I'm still kicking myself over that one. I suspect I will be for another five as well. And best yet - we didn't wear pastel tuxedos. We just had simple sport coats and white shirts. For any would-be groom or bride - I've said it before and will say it again: spring for a good photographer. Don't get an MFA candidate for $60 and hour. We got 68 shots - most of them unusable. To be fair to Jordan, I didn't confirm that his MFA wasn't going to be in ceramics - so that one is on me. When you break it down, it's less than a dollar a shot. I totally got what I paid for. 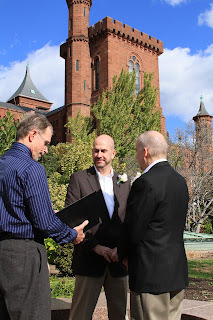 I expect to get an email from Ed, our officiant, tomorrow. I was hoping to do a surprise for 710, but that didn't pan out. So I was going to do a special menu of some kind at home, but he'd like to go out - so that is what we will do. happy anniversary! spouse and I always go out to eat for our anniversary cause it breaks up the routine. Happy Anniversary. Pink isn't your colour Blobby. congratulations. its a nice feeling, isn't it? Indeed, may the next 8 years be even more wonderful for you two.